You are at: Home » Sports » Fisd Wizards in trouble! 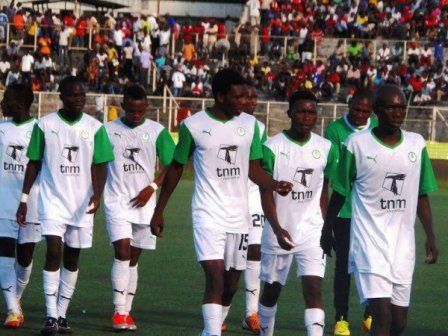 Kelvin Thotho scored the late winner to inspire Epac FC to a hard fought 1-nil victory over struggling and Malawi top league rookies Fisd Wizards in a league match at Kamuzu Stadium on Sunday afternoon. The Peter Mponda’s side were without the duo of goal keeper Brighton Munthali and midfielder Levison Maganizo who are in Tanzania with the Malawi National football team. Both teams started the game on a slow pace as few chances were created. The first real chance for the hosts came on 11th minute through Benard Chimaimba who fired wide from a close range to frustrate the home fans. At the other end, Epac almost scored through their striker who failed to pounce on a defensive error by the hosts. Chances were few as the midfield battle intensified. In the second half, it was the visitors who were threatening especially in the middle of the park but their front line lacked finishing composure in front of goals. Ernest Tambe combined well with Chimaimba to release Precious Msosa who instead of making a cool finish, was dispossessed by on rushing Jide Mbandambanda. Football fanatics thought the game was heading for a goalless draw but the visitors got their goal with some few minutes remaining on the clock through Thotho following brilliant display of football from the left flank of the field, 1-0. The hosts did their level best to level the score line but Epac FC held on to collect three points from their two assignments. On Saturday, they lost 2-1 to Red Lions. The result sees the Lilongwe based side climbing up to 11th with 18 points but Mponda’s boys are still stuck on position 15 with 11 points from 18 games. In other result, Civo Service United and Kamuzu Barracks played to a goalless draw at Civo Stadium. Big Bullets still lead with 41 points from 17 games with Mafco FC coming second with 31 points from 18 games. A Mponda team munaba and u expect to do better? Tikuonani mmene mutathere munthu osayamika iwe. Hahahaha.mpunga mpunga ndi superleague??? ?.Mr mponda teach yo players to shoot&score 4m far..ts only Barca manages mpunga mpunga. Never loose hope Mr Mponda, you have tried ur best. Tell your boys to tighten their efforts you will do better. Osadanda M’ponda sutuluka mu LEAGUE,dikira 5 December. Nothin strange coz u were already warned Mr Mponda dat dis is Super League Uisovenge kkkkkkkkkk!!!!!!! Mwachepa nazo a Fizd inu!..,anzanu amapita kwa Ayaya—-mwina muwafunse kuti zimakhala bwanji kwa Ayayako kkk!!! Beta kumalimbisanadi mitima kumeneko aza wise wina amwa tameki. For the Sunday evening this is the real deal.. For more information kindly inbox me. This is superleague Mr. Mponda.. Go back and gate prepare… Why are you just sharing points???? Mukufuna kutchukisa ma team eti??? U HAVE DONE AGREAT JOB. MA SOJA AJA NEXT SEASON MU KAWATHIBULE CHIFUKWA NJENJETE ZA MU CAPITAL NDI AKATUNDU. SUPPORTER WA MA CENTRAL BANKERS & ARSENAL & ST.GABRIEL MEDICALS ALI HAPPY. NANGA SI ARSENAL 3 ~ INAYO IYOOO !!. O.